Approaching Goudhurst from the west the road climbs a steep hill. Where the road almost levels out is West Road and the first property on the right is The Bricklayers, formerly known as The Bricklayer’s Arms and Edburton House. The original property on this site is believed to have been built in the 16th century and at that time it was a house not a pub. In the early1840s the owner of the cottage was Thomas Joy, a bricklayer, and in the 1841 census it was referred to as Joy’s Cottage. Thomas’s tenant was William Penfold, also a bricklayer. William lived there with his wife and family. By the time of the 1851 census, William had built two cottages at the back of the original cottage. The family was living in the new part and his wife, Mary Ann was running a “beer shop” in the original part that fronted the road. It is probable that the name “The Bricklayer’s Arms” was derived from William’s occupation. In 1851 William’s daughter, Emily, married Charles Humphrey. Charles and Emily lived at The Bricklayer’s Arms and Charles continued to run his carrier business from there as well as running the ‘brewhouse’. By 1861 they had five children. William and Mary Ann Penfold, now aged 69 and 67 respectively, were living in one of the cottages behind the pub. Thomas Penfold, a blacksmith, was living in the other cottage with his wife and four children. The 1871 census shows that William Penfold, now a widower, was still in the cottage and Thomas Penfold had moved to Ightham. Charles and Emily Humphrey were now living in one of the cottages with their six children. Charles was running his carrier business with assistance from their son William aged 12 years. Their daughter Fanny, aged 18 years, was a dressmaker. James Gilbert had taken over the running of the Bricklayer’s Arms and was living there with his wife Mary and two young children. James held “the Brick” (as it became known locally) until 1894 when he moved on to The Duke at Hartley and then to the Railway Hotel where he died in 1911 aged 68 years after a long period of ill health. During his time at Goudhurst James was a well respected individual. He served as Colour Sergeant in the Weald of Kent Rifle Volunteers for twenty five years, retiring in 1894, and was also Captain of the Weald of Kent Fire Brigade. In 1883 James Gilbert’s daughter, Fanny, had married James Thomas Dann. 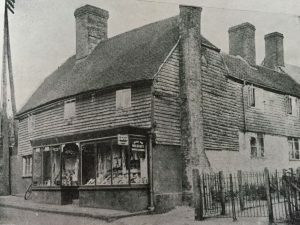 James had been running a bootmaking business in Goudhurst for many years until 1894 when he took over the Bricklayer’s Arms from his father in law. James Dann made such a success of the business that the brewery offered him a place at the new George Inn at Lamberhurst. He moved there in 1897 and a new landlord had to be found for the Bricklayer’s Arms. John Sullivan became landlord at the Bricklayer’s Arms in 1897. He had been keen to take over the pub when James Dann left but had been ‘pipped at the post’ by another man. However, the new man was found to be of unsound character and the brewery let him go. The brewery asked John Sullivan if he still wanted the pub and appointed him straight away. 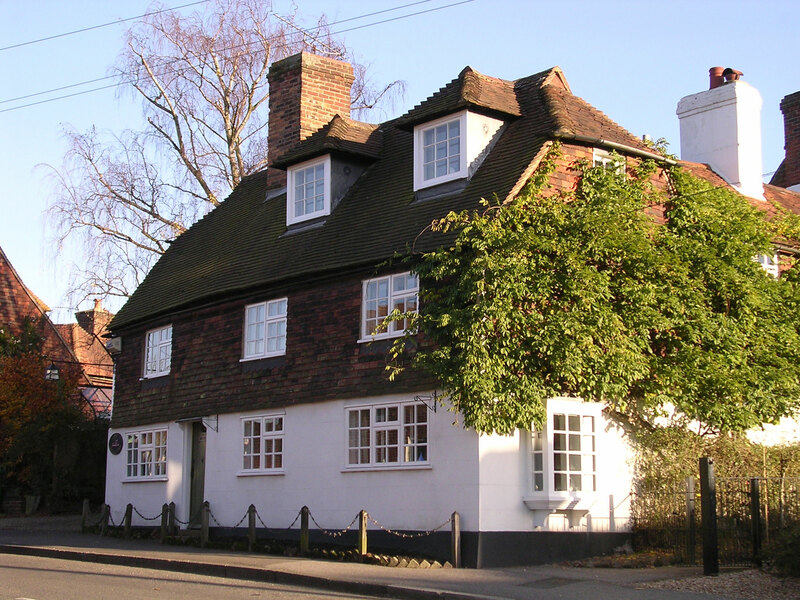 John ran the pub for ten years before moving to The Queen’s Head at Hawkhurst where he stayed for six months before returning to live at Goudhurst working as a farm labourer in Horsmonden and then at Crowbourne. In the Goudhurst Coronation Book John Sullivan recalls that Thomas Fuller took over the Bricklayer’s Arms for a short while after he left. However, the 1911 census shows Tom Head living there with his wife Naomi and daughter Alice. Tom is shown as a ‘Beer House Keeper’ and Naomi and Alice as ‘assisting in the business’. Later that year John Edward Whittle took over as licensee of the premises. The Kelly’s directory of 1913 shows Frederick Thomas as a ‘beer retailer’ in Goudhurst, and then in 1915 it shows him at The Bricklayers Arms. At the Cranbrook Licencing Sessions in March 1916 the licence for The Bricklayer’s Arms was withdrawn on the grounds of redundancy. The reason stated was; “being only 170 yards from The Vine, and also it was very low-pitched and badly situated for roadside trade by reason of its situation at the top of a very steep hill”. In June1916 John Whittle enlisted with the Royal Engineers Railway Operating Division giving his home address as The Bricklayer’s Arms, but when he was discharged in November 1917 he went home to Eastbourne. Little is known about the property after 1916 when The Bricklayer’s Arms closed until 1922 when Charles Hickman advertised in the Kelly’s directory as a grocer there. However, there are no subsequent entries for him. Then, between 1930 and 1939, Gilbert Bernard Fenner is listed in the directory as a grocer at Edburton House. The name of the house and cottages had changed to Edburton House and Edburton Cottages. When Mr Fenner gave up the house and shop he moved to 2 Lidwells Lane where he lived with his second wife Violet until he died in December 1968. In 1946 Mr F S Harding and his family had moved in to Vine Cottage in the High Street. 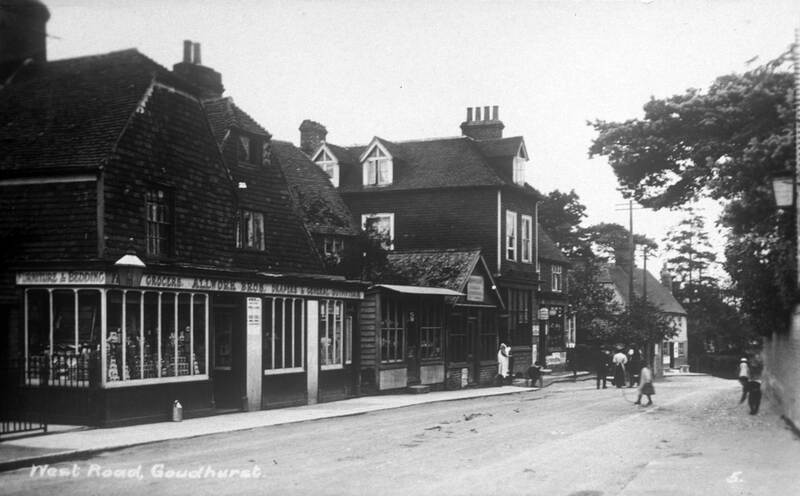 He had come to Goudhurst to take up the post of shop assistant in the newsagents. A few months later Edburton House and shop was vacant and Mr Harding took it. 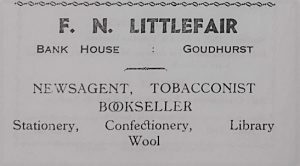 The trade directory of 1948 shows Mr F S Harding running a general store. When hop-picking time came around, Mrs Harding was advised to put up wire netting around her shop counter, but being a Londoner herself she declined. The following day a hop-picker came into the shop, wrapped his arms around a wheel of cheese that was standing on the counter and beat a hasty retreat. Mrs Harding had the netting in place when the shop opened the following morning. In 1951 Mr H Tildersley was advertising in the Parish magazine as “Mr Harding’s successor”. Mr Harding had moved to Tunbridge Wells. Mr Tildesley was still advertising in 1953 but we do not know when he ceased trading. In the 1960s the house and shop had been standing empty and was falling into disrepair. By the start of the 1970s Edward “Ted” McGuire had bought the house. It had been renovated and converted to a fully residential property and by 2000 it was known as The Bricklayers. It is still a private residence today. West House was built in the late 16th century and has since been enlarged. There is a fireback in the drawing room dated 1650. William Stevens, was the master of the first National School in Goudhurst from about 1816. William also became village postmaster and ran the post office from the front room of a cottage at the National School at Clay Hill. The 1841 census shows him living at Webb’s Cottage, named after its then owner, James Webb. The 1842 tithe apportionment schedule show the property still owned by James Webb and comprising a shop, house and garden with William Stevens in occupation. William subsequently purchased Webb’s Cottage and, when he retired from the school, transferred the post office business there. When William died in 1858 his son, George Monckton Stevens became postmaster at West House. He lived there with his wife Mary, his sisters Emily and Matilda and their mother Harriett. Harriett is listed on the 1861 census as a ‘bookseller and stationer’ and George is shown as a ‘solicitor’s clerk and postmaster’, Emily was the ‘Postmaster’s assistant’ and Matilda was a ‘milliner and dressmaker”. By 1871, Matilda had taken a shop in North Road. Her sister Emily and her mother Harriett had moved to the new cottage with her and Emily was assisting in the business there. George and Mary’s son, William Frederick, and his wife, Elizabeth, moved into West House with his parents. When George died in 1878 his daughter, Matilda took over the role of village postmistress at her shop in North Road. The 1861 and 1871 census had listed the cottage as The Post Office but after Matilda became postmistress at North Road, the 1881 census listed it as West House. The 1881 census showed George’s daughter in law, Elizabeth, running the stationers business at West House while her husband, William, carried on working as a surveyor and attorney. George’s wife Mary died soon after him in1880. Elizabeth continued to live at West House and carried on as ‘stationer and bookseller’ until her death in 1930 aged 83 years. Before her death the shop had been taken on by C & A Smith & Co. and Mr H Lowther was running the newsagents business with Mrs Stevens. When she died Mr Lowther carried on there until 1935 when Ernest James Ward had taken over as proprietor for the company. When the Westminster Bank moved to new premises on the Plain in 1934 Mr Ward extended the business to include book lending when he moved into the shop premises at Bank House next door. By 1937 the newsagents had also expanded and was selling knitting and rug wools and held a stock of fashion pattern books for women. In around 2007 the shop at West House was called “Hearts and Flowers”. When it closed West House became a private residence but still retains the old shop window. Bank House was built in the 1860s by George Monckton Stevens after he had inherited West House from his father, William Stevens, and became Goudhurst’s postmaster. The new building was attached to West House. 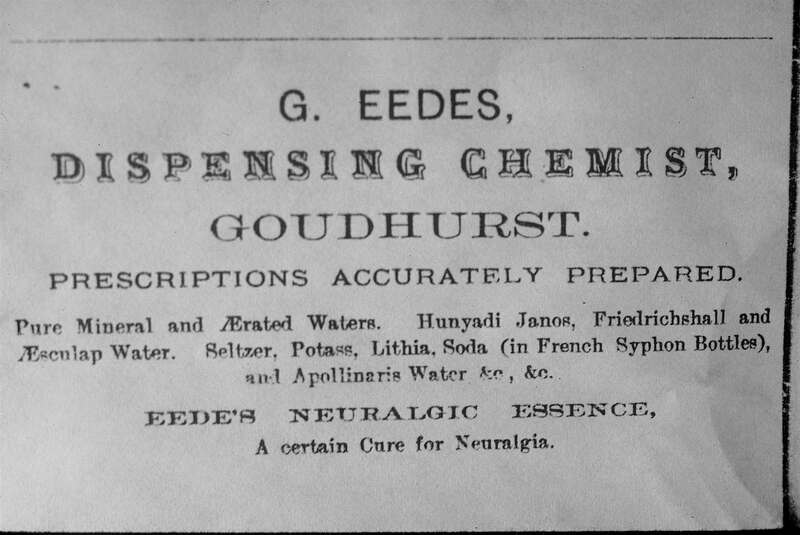 One of George’s first tenants was George Eedes, a chemist and druggist, who had previously been living at Gazebo in the High Street with his wife Annie and their first baby, a daughter also named Annie. 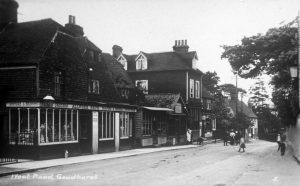 However, by 1881 George and his growing family had moved to Manor House in the High Street where he remained until he retired to Edenbridge in 1917. The 1881 census shows the property as unoccupied. Then, in the Goudhurst Coronation Book, there is mention of Jack (John) Hobbs running what was described as ‘a kind of coffee tavern’ there where he sold coffee at a penny a cup. There were two or three adjoining rooms where social evenings were held and people could play bagatelle or listen to readings. Jack was only there for a short while until in the mid 1880s he moved to Church House in the High Street to run a new coffee tavern for Miss Frances Blair. On 4th April 1902 the Manager of the main branch of the London & County Banking Company in Cranbrook, Mr F E Gilbert, opened a sub branch in Goudhurst. This is when the property became known as Bank House. Mr Gilbert negotiated with Elizabeth Stevens to rent the corner front room of the house, which she had been using for her stationery business. In 1909 the Bank amalgamated with Westminster Bank and changed its name to the London, County and Westminster and then, in 1917, Mr Gilbert retired. Under a new manager the Bank changed its name again to Westminster Bank in 1923. The Westminster Bank was eventually moved to its newly built premises on the Plain in 1934. 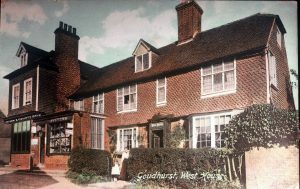 Following its amalgamation with the National Provincial Bank in 1970, under yet another change of name the National Westminster (NatWest) Bank in Goudhurst finally closed in 1996. 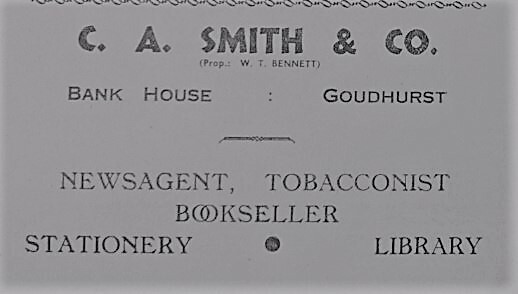 In 1935 C A Smith & Co., newsagents and stationers, extended their business at West House into Bank House and the proprietor, Ernest J Ward, set up a book lending library there. 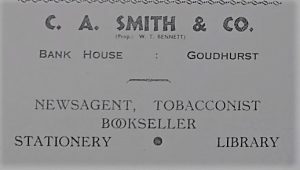 C A Smith was still advertised in the 1940 Kelly’s directory. In 1943 the parish magazine advertises Mr W T Bennett there. Mr F S Harding worked at the newsagents for a few months in 1946 until he took over Mr Fenner’s shop at Edburton House. 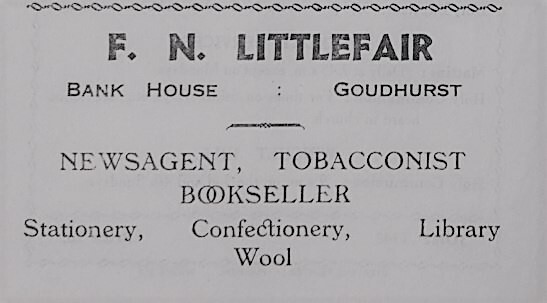 When Mr F S Harding left, Mr F N Littlefair was running the newsagents. He advertised in the parish magazine in 1948 and 1949 but we do not know when he left. In 2003 a kitchen design business was opened at the property but the company was dissolved in 2011. Viva Hair and Beauty Salon was established in June 2000 at Rootes Shop next door. Viva opened additional space at Bank House until the salon was eventually transferred there during 2015 and Rootes premises was closed. The name “Bank House’ was never an official name for the property and it is no longer used. (The official Bank House is in the High Street) The residential flat above the hairdressers is known as The Old Post Office Flat and the business premises are simply addressed as West Road. Rootes Cottage might possibly date from the 16th century and was, at one time, divided into three dwellings. The earliest owners are unknown but the 1842 tithe apportionment schedule shows Samuel Ford as the owner and occupier. In the early 1800s there is a record of a few former owners and occupiers taken from an indenture, dated 6 April 1857, between John Allwork and Thomas Allwork in connection with the property next door. It showed that the other property benefited from the use of a well in the garden and the owners or occupiers of the other property were required to pay towards the upkeep and repair of the well and its ropes and buckets etc. In around 1868 the property was purchased by James Johnson from Ninfield and he started a business as a saddler and harness maker. He also built the sweet shop at the front of the property for his sister to use. 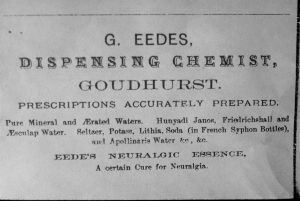 By 1901 James and his wife and family had moved to Marden and Thomas Goodsell, also a saddler and harness maker, was managing the Goudhurst business for him. Thomas and his family lived in a cottage along the passageway from the cottage. By 1911 Thomas and family had moved to Church Road. Edward Rootes, grandfather of William ‘Billy’ Rootes of Rootes Group fame, had long been a mechanical engineer in Goudhurst repairing threshing machines and tractors and he had a shed at the top of Balcombes Hill where he kept his workshop. Edward was widowed twice and it was around the time of his marriage to his third wife, Isabella Hicks, in 1897 that he moved to the cottage in West Road. They are shown living at the cottage on the 1901 census. He was to die there after a long illness in 1929. Isabella was running the sweet shop and continued to do so with help from her son, Henry Hicks. When Isabella died in 1942 Henry kept the business going. The last entry for Henry hicks – confectioner is in the 1948 Kelly’s Directory. At some time in the early 1900s Father George Mendham purchased the property and an inventory dated March 1935 shows Mrs Edward Rootes paying £11 per half year in rent to him. Father Mendham left Goudhurst that year and then died in Ireland in November 1935. Adverts appear in Goudhurst parish magazines from the 1960s to the early 1970s listing ‘Rootes General Stores’ here. In around 2000 the shop became a hairdressing salon run by Keith Francis. After a few years Viva Hair and Beauty opened. When Viva transferred to Bank House next door a food store opened. Finally the shop is now home to ‘Vintage Room and Café’. The cottage is now a private residence. Hughenden House overlooks the village pond at the Plain but also has a door that allowed access to the property from West Road. It was built in the 16th century and extended in the 17th and 18th centuries.. In the early 1800s the village pond at The Plain was known as Wall Pond and the house abutting it was known as Wall Pond House. There was a house, shop and warehouse in the front and a blacksmith’s forge at the back. In the 1820s William Woollven was running a grocers and drapers shop at the property. William died in 1827 at the young age of 32 years. He is buried in St Mary’s churchyard and a headstone still marks his grave. In April 1837 William’s brother, Charles Woollven, grocer and linen draper of Goudhurst, made a ‘deed of conveyance and assignment’. His creditors on the document are James Watt, Richard Tassell and Thomas Laurence who are all grocers in Maidstone. The 1841 census shows Charles and his wife and family living at “Wall Pond House” and he is listed as a grocer and draper. However, the 1842 tithe apportionment schedule shows the owner of Wall Pond House as Matthew Kelland and Charles Woollven as the occupier. Matthew Kelland was his brother in law having married his sister Frances in 1822. By the time of the 1851 census Charles and his wife had moved to Maidstone. In 1844 John Allwork, a cooper in Cranbrook, had set up a grocery business at Wall Pond House. The 1851 census lists Thomas Allwork, his nephew, at the property as a grocer and draper. He has Ann Langridge living there as his housekeeper and Charles James Chaplin there as his 15 year old apprentice. Thomas married Jane Bull in 1859 and by 1861 they have two sons, William and John and by 1871 they have one more son, Charles. The three Allwork brothers helped their father in the shop until he died in 1892. In the same year John married Elizabeth. 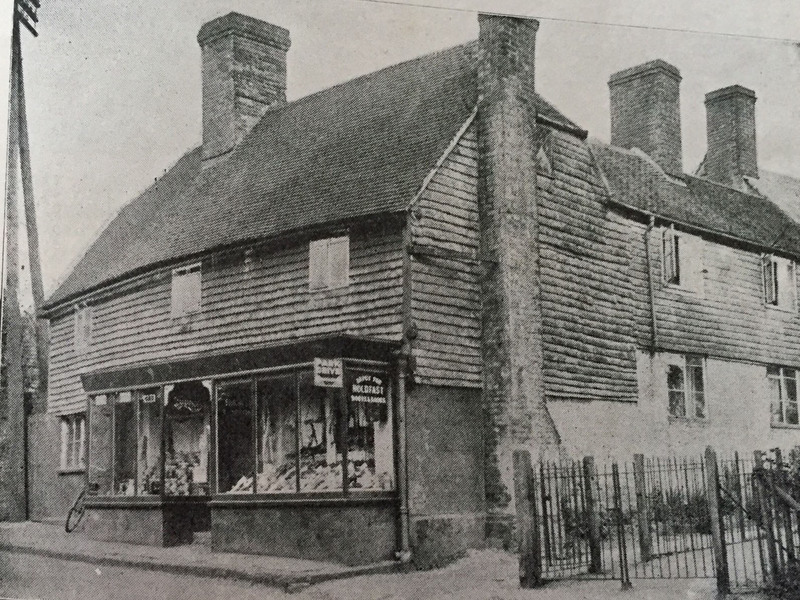 John, Elizabeth and Charles ran the shop at Goudhurst trading as Allwork Brothers, and in around 1895 William moved to Kilndown and opened a second shop there. The business was in decline and finally in March 1912 William, John and Charles gave up the business and the property was sold. Father George Mendham, the local Catholic Priest, purchased the property for the sum of £300. For 15 years Miss Caroline Button had been running a drapery shop at Tattlebury Corner. Miss Button now rented the premises at West Road from Father Mendham and transferred her business there. She had previously traded as “C. Button, Vigo House, Goudhurst” and when she moved to West Road she kept the name Vigo House. Miss Button ran the shop until she died in April 1936 and then her niece, Gertrude Bradford, who had worked with her continued running it for a few more months. In March 1935 Father Mendham had sold the property to the Ancient Buildings Trust (the forerunner to the National Trust) for £1200. Mrs Hudson sold the business in 1946 and moved to Cranbrook. We do not know who bought the business but the guesthouse and tearoom continued. 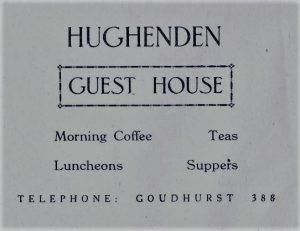 The Ancient Buildings Trust sold the property to Miss Elsie Beatrice Ellington in 1950 and she continued the tearoom until October 1952 when the property was sold to Miss Gertrude Evans. Miss Evans carried on with the existing business but also added an antique gallery. She apparently put a price tag on all the furniture in her guesthouse and tearooms, which caused much amusement among her guests. In 1960 Vyvyan Winn and Lorna Stroud purchased the property. They started by serving all meals and accommodation but they soon found they needed to adjust their workload and decided to offer just morning coffee, afternoon teas and overnight accommodation. Since Lorna sold the property in 1986 it has had a succession of owners. It later became a restaurant but eventually that business closed and the property was sold. After much renovation a dealer in antique clocks and barometers now occupies it. The original name for this property was Brickwall. In his book “The History and Topographical Survey of Kent”, published in 1798, Edward Hasted recorded that the Rev. Mr Thomas Bathurst of Finchcocks owned it. Since then the property has been added to and its name has changed more than once. Notes in the Goudhurst Jubilee Book 1935 tell us that the ‘original occupant’ was a man named Baker who was a rope maker. He lived in a much smaller cottage than that which exists today so it may be that this was one of the farm buildings rather than the main house. Thomas Henry Baker made rope as well as sail cloth, hop pockets and other items between the early 1850s and 1860 when he moved to Tonbridge. His business was in Rope Walk. Next we are told that the Lake family of Taywell took it on, enlarged it and built a brick wall around it to give the grounds privacy. However, none of them lived to occupy it. Later it became the property of Mr Hussey of Scotney Castle. 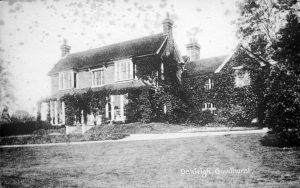 In about 1864 Dr. Robert Samuel Newington, son of surgeon Samuel Wilmott Newington of Tattlebury House, returned to Goudhurst with his wife Lucy. Samuel had previously purchased the house and Robert and Lucy moved in there. It was Robert who renamed it Oakley after the house they had lived in in Wales. When his father died in 1868, under the terms of his will, his trustees advertised Oakley for sale together with some plots of land Samuel had owned. Robert moved to Tattlebury House where he carried on his late father’s work. In the 1870s Lady Nott and her daughter, Miss Rose Caroline Twisden-Hodges, lived at Oakley. In October 1876 the village was decorated for the wedding of Rose to Captain Henry John Peareth. Then, in 1880, Miss Sophia Dashwood came to Goudhurst and established a school at ‘Oakleigh’. The 1881 census lists all the scholars, aged between 5 and 19 years, as ‘cripples’ . The local press described her as “a kind hearted lady who receives crippled children into her home and has them educated into the tenets of the Catholic faith”. Although she was baptised into the Church of England, Miss Dashwood had later converted to the Catholic faith and she was instrumental in establishing the Roman Catholic Church (the Church of the Most Sacred Heart) in Goudhurst. She had a small wooden chapel erected in the grounds of Oakleigh that was accessed from West Road through a wooden gate in the garden wall. The gate is till there today. 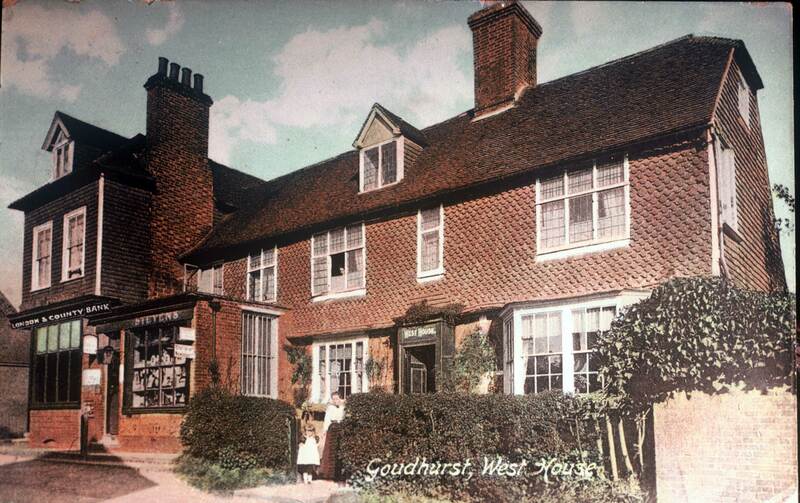 In 1892 Mrs Katharine Sumner Gibson, a widow, came to Goudhurst. She lived at Oakley for 21 years until her death in 1913. Following Mrs Sumner Gibson’s departure, Major Eric Stockwell bought Oakley. He improved the interior of the house and also had the Lodge built. After the major died in January 1919, Mrs Mary Stockwell married Captain Charles Slater in June 1920. Together they enlarged the property by purchasing additional fields belonging to the Manor Estate. When Captain and Mrs Slater left Oakley House in 1923, Mr R T jones bought the property. He pulled down some of the old rooms facing West Road and built a small residence in the grounds that he called Oakley Cottage. 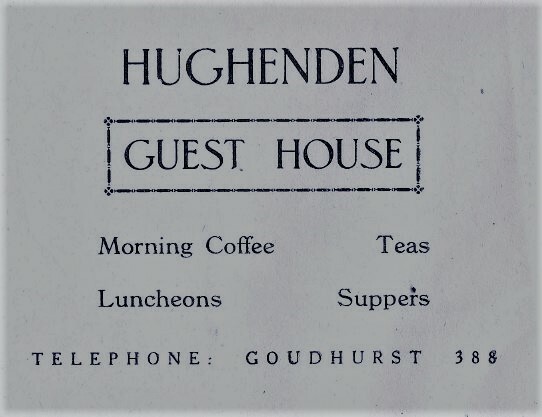 In the Parish magazine for July 1928 it is recorded that Mr Jones invited members of the Goudhurst Women’s Institute to the gardens of Oakley House and he arranged for the Brass Band to play for them. After a few years together at Oakley Mrs Jones died. In May 1935 Mr Jones moved to Tunbridge Wells and Mr Frank Simmonds, of Manor House in the High Street, bought Oakley and shortly after put it up for sale again. By 1939 Miss Margaret B Reid had purchased Oakley and opened a boarding and day school there for boys and girls aged 4 to 11 years. The property was renamed Pinehurst and the school took that name too. In 1951 Miss Reid sold the school to Mrs M D Price. Just two years later, in 1953, Mrs Caroline E G Feek took over as Principal at the school and slightly adjusted her terms to take boys aged 5 to 8 years and girls aged 5 to 13 years. After Pinehurst School closed following Mrs Feek’s bankruptcy in 1962, the property was divided and today there are four separate residential properties on the site, Pinehurst, The Knowle, Ainslie Cottage and Pinehurst Cottage. The original fire station and Brigade headquarters was in North Road and housed a manual pump engine. In that same year a new steam powered fire engine had been purchased and on Tuesday 25 August 1874 it finally arrived in Goudhurst, drawn by four horses, amid great pomp and ceremony. Early in the morning of Wednesday 17 November 1875 a fire broke out in the old engine shed and the wooden building in North Road was completely destroyed. The Brigade members had managed to get the new steam engine out before the fire took hold but alternative premises were now needed to house the engine and to provide headquarters for the brigade members. Before the day of the fire, talks had already been under way to provide a new engine house more suited to the new steam engine and fundraising was now started in earnest. In the meantime Jarvis Lambert, of Yew Tree Cottage in Church Road, looked after the engine. A suitable site was found at the old Manor Pound adjacent to Oakley House and Mr I T Potter built a new engine-house there at a cost of £120, almost half of which was found from public subscription. On 27 March 1878 the Weald of Kent Fire Brigade took possession of its new premises and the engine was brought from Mr Lambert’s house to the Plain. In 1930 a new engine was purchased and it served the Brigade until a motor engine fire tender was built from an ex RAF fire tender in 1940. When war was declared in September 1939 a floor was constructed in the roof space of the old fire station to provide sleeping accommodation for brigade members so that they would be immediately available in the event of a fire or other emergency. 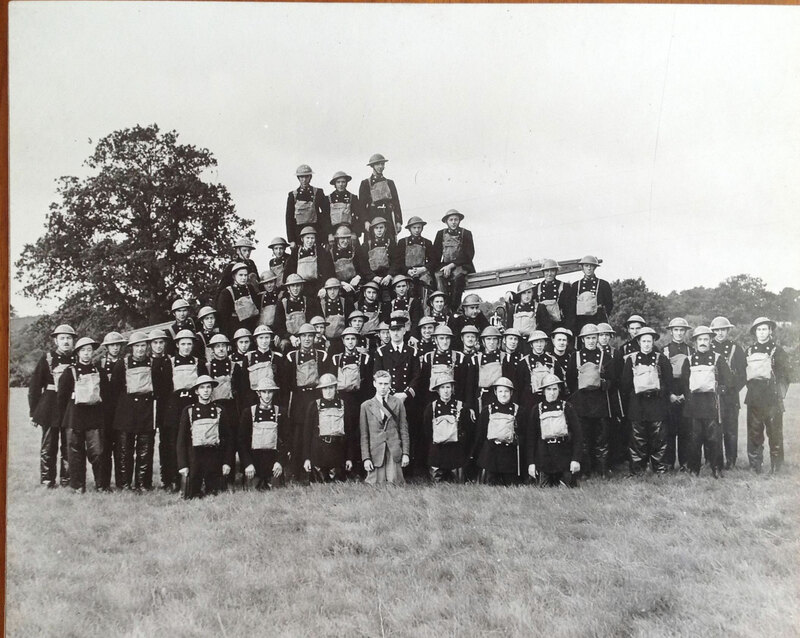 In 1941 the Brigade was taken over by the National Fire Service and soon after, in early 1942, it was decided that a new fire station was needed. The Ex-Servicemen’s Club agreed that a sectional building could be erected on land that they owned between the club and Mallard’s House at a rent of £2 per year. The new building provided housing for the fire engine as well as comfortable, heated accommodation for the firemen. 1948 saw the end of the National Fire Brigade and fire services in the county were handed over to the Kent County Fire Service. The temporary war time fire station was no longer appropriate and the building was sold to the Ex-servicemen’s Club. A search for alternative land for a permanent station was unsuccessful and so the Goudhurst Fire Brigade was axed. The Old Fire Station is now an annexe to The Knowle.